The seeing was very poor so the laptop image was leaping around but I was able to get a pretty good focus using a Hartman Mask. I have made a separate web page showing mosaics produced from these images, there is a link at the bottom of this page. 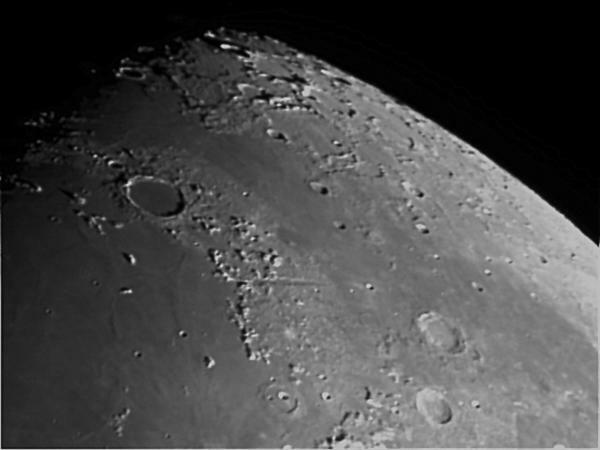 Valley dominate this image with the huge Mare Imbrium in the bottom left.. The large crater centre left is Plato, with Bliss just to the north west. South of Plato, you can see Mons Pico with the crater Piazzi Smyth and the 2800m high Mons Piton to its south-west. The two large craters in the lower right quarter of the image are Aristotles and the smaller Eudoxus. 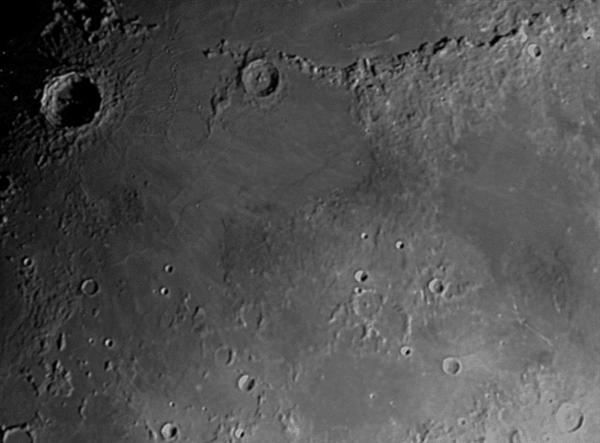 Mare Frigoris streches from north of Plato, diagonally downwards to the bottom right corner of the image. At the south end of the Lunar Alps lies the shallow crater Cassini, with its two inner craters, A and B. The larger of these, A, is 17km across. Moving south, we come to the Caucasus Mountains with the craters Timocharis, Archimedes (the largest), Autolyus, Aristillus and Theaetetus in the chain from west to east across Mare Imbrium. The north end of Mare Serenitatis is just begining to show in the bottom right corner of the image. The Appenine Mountains dominate this image, with the crater Eratosthenes at the western end. 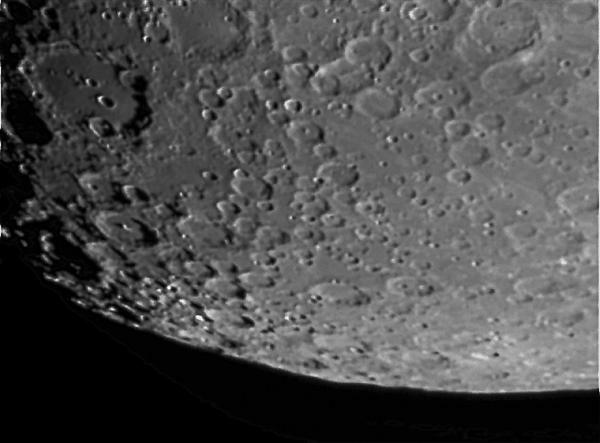 Much more of Mare Serenitatis is now visible, with one of the bright rays from crater Tycho cutting across it very close to the crater Bessel. 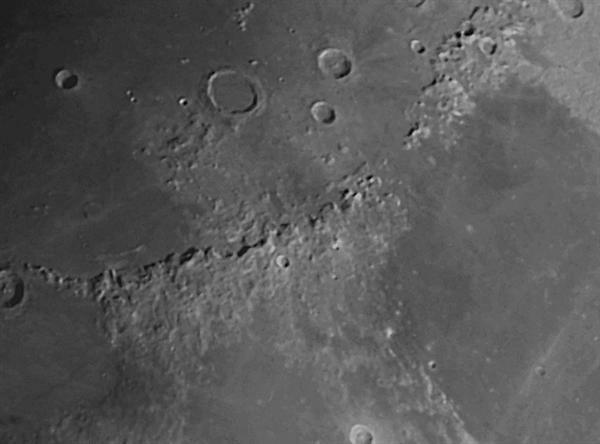 The crater Manilus is prominent in the bottom centre of the image. 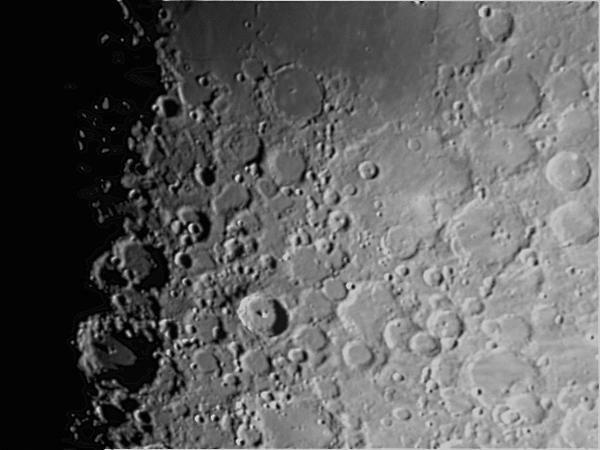 The Appenines strech across the top of this image, towards Eratosthenes with its three central peaks and the large, deep crater Copernicus. Notice the light streaks radiating outwards from this crater. These streaks are the crater rays formed from material which was ejected at the impact which produced Copernicus. You can also see the complex walls and central peaks of this crater. Between these two deep craters lies the "ghost" crater, Stadius which has been almost completely flooded by the mare lavas. 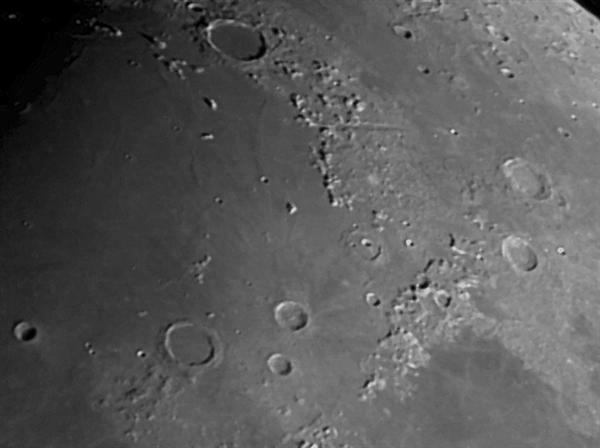 In the bottom right hand corner lies the crater Agrippa, its central peak still showing although it is overexposed. To its north lies the small crater Hyginus which lies at the join of two very obvious light lines. These lines form Rima Hyginus which is 220km long, 2-3km wide and several hundreds meters deep. The northern part seems to me made from a string of craters. Another more obvious sinuous string of craters lies between the two main craters at the top of the image. You can also see the wrinkle ridges in the top part of the image, formed in the final cooling stages of the mare lava flows. The top part of this image shows the south end of Mare Nubium. Just to the right of the prominent small crater in the top right you can see a vertical dark line. This is the southern end of the "Straight Wall", a 110km long, 25km wide fault. The large flooded crater with the central peak in the southof Mare Nubium is Pitatus. The complex of craters further south is dominated by Longomontanus in the bottom left corner with the famous rayed crater Tycho just to its left. Tycho's central peak shows up well. The large crater in the top left is Clavius, with Rutherford justinside its southern wall and a curving chain of craters across its floor. The crater to the south with the prominent central peak is Moretus. Click here to see some of these images combined to make mosaics of the Moon.